NASA Earth Observatory images by Jesse Allen and Joshua Stevens, using VIIRS data from the Suomi National Polar-orbiting Partnership and IMERG data provided courtesy of the Global Precipitation Mission (GPM) Science Team’s Precipitation Processing System (PPS). Caption by Michael Carlowicz. 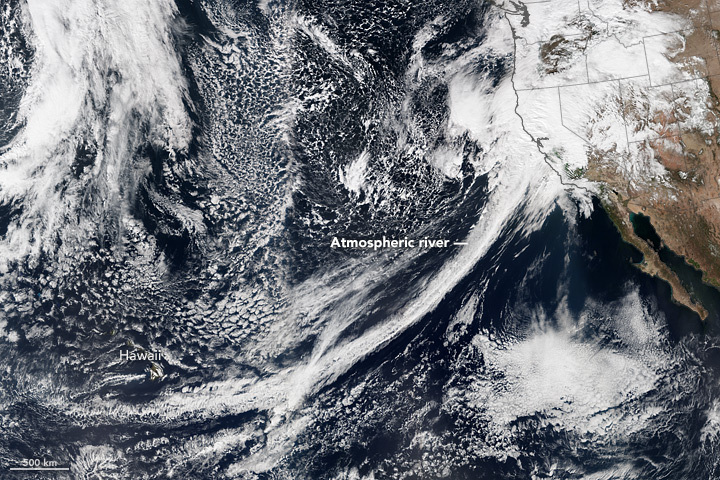 Yet another series of atmospheric rivers has drenched California and the American West in a stunning turnaround from five years of drought. Many parts of California have received nearly twice as much rain as normally falls in the first five months of a water year, which began on October 1. Flood and landslide warnings are in effect in many counties, particularly in the Sacramento Valley, which is crossed by several rivers and sits downstream from several large reservoirs and dams. According to news reports, more than two dozen mud/debris flows have been reported across California, and at least 30 major roads have been flooded at various times in the past week. Spillways have been opened at the Anderson, Oroville, and Monticello dams, among others. On February 20, 2017, the Visible Infrared Imaging Radiometer Suite (VIIRS) on Suomi NPP captured a natural-color image (above) of conditions over the northeastern Pacific. Note the tight arc of clouds stretching from Hawaii to California, a visible manifestation of the atmospheric river pouring moisture into western states. 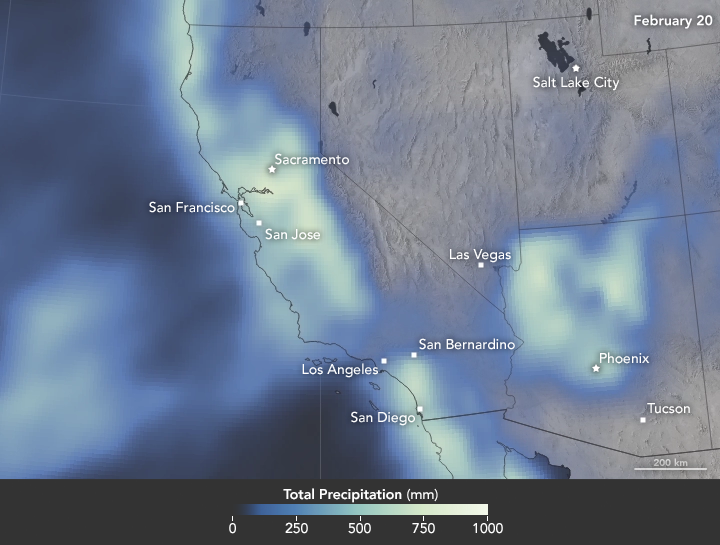 The map below shows satellite-based measurements of rain, snow, and other wintry precipitation as it has accumulated over California, Nevada, Utah, and Arizona this year. Specifically, it adds the daily precipitation totals from December 31, 2016, to the evening of February 20, 2017. (You can download an animation of this accumulation via the link below the image.) These are remotely-sensed estimates, and local amounts can be significantly higher when measured from the ground. The brightest areas on the map depict as much as 1000 millimeters of precipitation, or 39.37 inches. Las Vegas Valley set a new record rainfall on February 18, measuring 0.43 inches that day. Locations on the west side of the valley received double that amount. Meanwhile, in northern Nevada, Mount Rose has been buried under 500 inches of snow this winter. The Mount Rose Highway between Reno and Lake Tahoe has been closed by an avalanche that dropped 20 feet of snow on the road. The Weather Channel (2017, February 21) Dangerous Flooding, Landslides, and Damaging Winds Will Linger in California Through Tuesday. Accessed February 21, 2017. Category 6 Blog, Weather Underground (2017, February 21) More Floods and Evacuations in California—Plus Wind Gusts Topping 190 MPH. Accessed February 21, 2017. Reno Gazette-Journal (2017, February 21) Avalanche blocks Mt. Rose Hwy., part of U.S. 50 may collapse. Accessed February 21, 2017. Las Vegas Review-Journal (2017, February 21) Avalanche buries highway between Reno, Lake Tahoe. Accessed February 21, 2017. Las Vegas Review-Journal (2017, February 18) Big storm helps Las Vegas Valley break Feb. 18 rainfall record. Accessed February 21, 2017.